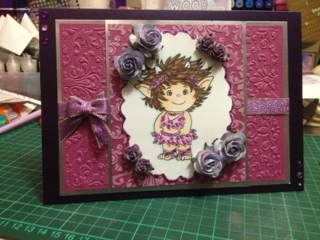 I have made this card using purple pearlised card stock, silver matt card, purple coordinations card and then used a darice embossing folder, and I have sanded the small card stock. Then coloured in Sky from the toread rubber stamp collection with my spectrum noir pens in crafters companion colours. I love these images and your colour combination is fabulous and I love the beautiful flowers too. Gorgeous card. I love your choice of colours and how you've coloured in the Toread. Really sweet - beautiful colours.